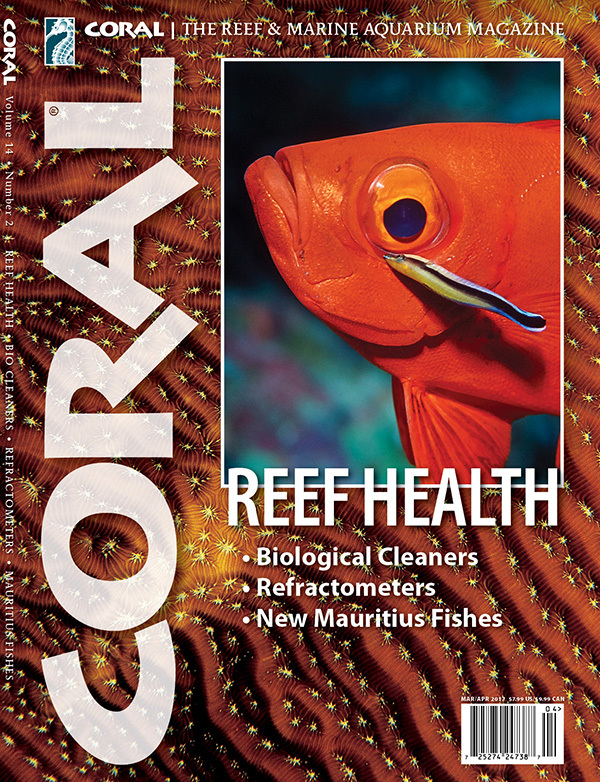 CORAL’s planned cover for March/April 2017, Volume 14, Number 2. Crescent-tail Bigeye being groomed by a Bluestreak Cleaner Wrasse. Don’t miss this outstanding issue! There is still plenty of time to reserve space, contact us today! Mike Tuccinardi doing field research for Project Piaba. • Do fish feel pain? What about invertebrates with tiny brains: do they have feelings we need to keep in mind? Must-read, thought-provoking reading from scientists, not our friends at PETA. • Diagnosing disease and dealing with parasites that can bring down fishes and corals, with hands-on practical ideas for preventive care and stopping aquarium disasters before they happen. • Using biological cleaners to constantly patrol reef aquariums for pests that can attack and kill corals and fishes if allowed to proliferate. • Refractometers are now more affordable than ever: is it time to get one and learn how to use it for enhance test results? • Aquarium photography is undeniably more popular than ever before, and this popular series by Daniel Knop continues with a look at flash gear and tricks. – PLUS: New fishes, new corals, new ideas for making the most of a marine aquarium, along with the aquarium trade’s latest products – all from the world’s leading saltwater-only aquarium magazine. Don’t miss this outstanding issue! Background: Agaricia lamarcki, Werner Fiedler.